The Minimalism Game – success! I made it until day 26, which means that I got rid of 351 things. Yes, technically, I didn’t win, i.e. make it until Halloween – that would have meant removing an additional 145 things. But that’s ok. Considering that I only have one room to declutter (most of the kitchen stuff belongs to my roommates), and things were already pretty minimal, I’m more than satisfied. I got rid of many things that I wouldn’t have questioned otherwise – why do I keep every postcard I receive in a box I never open? Who needs 71 buttons? Why do I own a CD when I don’t own a device that can swallow it? Just a sample of the fascinating questions I had to ask myself this past month… I hope I stay in a decluttering frame of mind over the holidays, since I’ve discovered that that is the best prevention to accumulation and the holidays are, well, a risk factor. I’ll maintain momentum by getting rid of one thing a day. The resolution was not specific enough. What is slow, even? That word means nothing when you’re hungry and only have 20 minutes for lunch. On the next try, it has to be something like “Chew at least 15 times” or “Put your fork down every three bites.” Numbers. Best way to specify a habit. I didn’t track my progress. While I took notes of every thing I got rid of and kept track of my September habits daily, I only took one little note regarding slow eating. On October 6th. As the month progressed, I remembered to slow down at fewer meals, until it had no influence whatsoever on my behavior. Next time, I should write a little note after every meal, recording my progress and keeping the resolution in the antechamber of my mind. This will probably also help in defining “slow”, since I’ll be forced to think about it at least three five times a day. But I did learn a valuable lesson (which I recorded on October 6th): When consumed slowly, convenience foods to not pass the test: when you try to actually enjoy and savor them, they really don’t taste good enough to even deserve to be eaten. I also learned that this is a lesson you forget about as soon as you stop eating slowly. How do you deal with setbacks? How do you formulate resolutions to make sure they are specific enough? I hope you were more successful with your habits in October! Of course we know we’re supposed to make a grocery list and stick to it like it’s the law of the land. We also know that we’re not supposed to go shopping on an empty stomach. And yet, sometimes, even when sticking to these golden rules, our grocery cart does not match our good intentions. But there is a way out. It’s easier than self-control and way, way, way more fun. 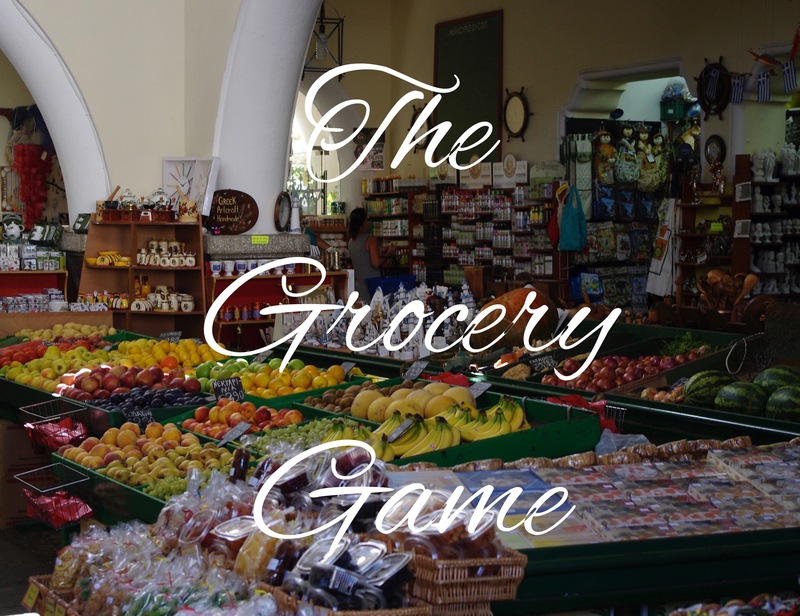 It’s a game you start playing when you fill your cart, and at the checkout line, you’ll find out whether you won. Here’s how: you compare your grocery haul to what everyone else in line got. Whoever has the healthiest stuff wins. Sometimes, people buy very unhealthy things, like chips and coke – then victory is easy. Sometimes I buy these things (that’s how I recognize a really bad day). On those days, I admit defeat before even going inside. Another example of leaving my ambitions at the bike rack: buying the shockingly high amounts of chocolate and sugar required for my Grandma’s brownies. Usually, I throw in fruit and veggies to at least secure a bronze medal. Since you are both judge and competitor, you’re going to have to do your utmost to be impartial. But you also make the rules: if you believe bread is unhealthy, then deduct points from all bread buyers, yourself included. If you think sugar is a curse from the devil, make that known in your (silent) ratings. Gluten? Lactose? Animal products? Frozen meals? You judge their worth. Your choice of grocery store will affect the likelihood of your victory. The better the organic produce selection, the harder you’re going to have to work. Winning at a lower end store may be largely due to privilege, whereas Whole Foods is akin to the Olympics. This will change the way you shop – it was a game changer for me and my friends. If you buy whole foods, fruits, vegetables, rice, whole grain bread, cheese, etc. you are pretty much guaranteed victory. A candy bar and a bag of chips can be detrimental – so you’ll think hard about whether you’d really like to trade in your victory for a short-lived sugar high. Which incentives do you use to shop healthier?